CRO or Chief Revenue Officer is the person who is responsible for all the revenue generation process in a company. The role of this title is to ensure better integration as well as alignment between revenue-related functions such as revenue management, pricing, sales, customer support, and marketing. The job of CRO’s is always challenging, and that’s the reason they require a higher skill set for adequately managing the financial task. Apart from taking care of revenue related operations, the chief revenue officers must also be aware of current technological trends and work along with it. If your business is planning to get in touch with CRO’s of various segments, we are here to help you. Blue Mail Media’s CRO Mailing List lets you connect with your target audience of any industry. That is, you can have seamless interaction with the CRO’s of Oil and Gas industry, manufacturing industry, banking industry, telecom industry, and so many. Our list consists of the necessary B2B marketing information for you. Pick the ones that suit your business requirements and plan your marketing campaigns. 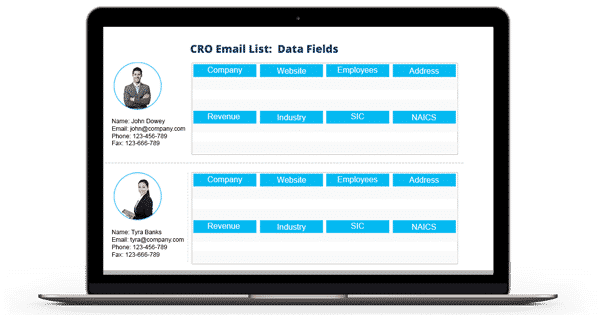 Blue Mail Media, one of the well-known data solution providers, is offering you the best CRO Executives Mailing List now. Grab it now if you want to reach the CRO’s working in various segments regardless of boundary constraints. That is, you can have seamless interaction with them no matter where they reside. Our list includes the data of CRO’s located several regions such as USA, UK, Europe, Russia, Africa, Asia, South America, North America, and other regions of the globe. Connecting with your potential clients is not trouble anymore. You can trust our CRO Email Database with no fear because we have a team of experts who take care of its accuracy level. They make thousands of verification calls and send thousands of verification emails to keep the list free from errors and duplicate data. Also, they update the list once in every 90 days to keep it clean and fresh. With currently valid contact information, our CRO List guarantees more than 90% deliverability rate. Hence reaching out to your potential clients is no more a tedious process now. Buy our list and improve your company’s revenue dramatically. Call us at 1-888-494-0588 or drop an email to sales@bluemailmedia.com for any clarifications! Our team of data scientists, analysts, and experts constantly dig out the most qualitative data to power your multi-channel marketing strategies. Also, we ensure that our List of CRO Email Addresses remains accurate and updated by making thousands of verification calls each day and sending out verification emails.